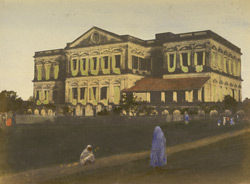 A hand-coloured print of the Military Orphan School, Calcutta, from the Fiebig Collection: Views of Calcutta and Surrounding Districts, taken by Frederick Fiebig in 1851. In 1790 a new building, at Kidderpore, south of the Maidan, was found for the orphaned children of Officers of the Bengal Army, and maintained by their brother officers by a system of monthly contributions. Another Military Orphan School, for the children of regular soldiers was at Howrah on the opposite bank of the River Hooghly.